It is Time to Deep Clean your Office! A yearly deep cleaning of the workplace does not just eliminate bacteria and viruses on germ-infested surfaces, yet it additionally permits you and your staff members to have a neat working atmosphere. A deep cleaning will address the overlooked areas which have built up dirt, clutter, germs, and grim. Get started deep cleaning your workplace with the following tips. Trying to deep clean a filthy office quickly can become a daunting chore. It’s possible to make it easier on yourself by creating a checklist of what must be cleaned, as well as on which day each chore ought to be conquered. Tackle a single room each day or tackle a certain chore, like cleaning the windows on one day and carpeting on the next day. Get a microfiber cleansing cloth and beginning at the ceiling, work your way down every wall. Do not forget to dust air vents, hanging lights, as well as ceiling fan blades. In order to make dusting more convenient, utilize a microfiber dusting wand for difficult-to-reach spaces, like the tops of shelves and ceiling fans. Dust every crevice, particularly vent corners and covers in which dust oftentimes becomes trapped. As tedious as this chore might be, it’s especially vital if you, your staff members, and/or your customers suffer with allergies. Removing the dust will decrease sneezing, which might assist in preventing the spread of viruses and germs. Decreasing dust also can improve the quality of air in your work place, and make the area seem less stuffy. Any surface inside the work place which touches food or hands will have a massive quantity of germs and bacteria. For that reason, disinfect smartphones, breakroom countertops and appliances, refrigerator shelves, and door handles. Make certain that you use an industrial-strength, quality disinfectant. You have to disinfect each inch of the restrooms, which includes exposed plumbing, the stall doors, and hand dryers. In addition, keep in mind to sanitize all the sink handles and faucets, and the doorknobs, particularly upon the entry doors. Most infections are spread by contaminated surfaces; therefore, the first place you should begin defending your work place against the flu is at desks, as well as additional work stations. Begin by taking off all non-work-associated items from all desks. It also is an excellent time to make a filing system for your archived and active paperwork. Have a couple of trash bags prepared, one for papers to shred and one for recycling. Put everything away that goes someplace else in the office. Utilize disinfecting wipes to remove fingerprints, dust, germs, and grime from electronics, like phones, mouses, and keyboards. One way to make sure the work place remains sanitized and cleaned includes hiring a cleaning service. In outsourcing cleaning, you’ll leave your staff members more time to do their own jobs. Additionally, a cleaning service could assist in saving you money and time in team member sick days. For more information on our professional office cleaning services contact Anago today! Do You Really Need to Hire A Commercial Cleaning Company? Do you really need to hire a commercial cleaning company? Some do, some don’t. By following the below tips, you might find that keeping your commercial facility neat and clean is easier than you first thought. In addition, if you do require an outside cleaning service, following the below tips might obtain you a lower price for the cleaning job if you do hire out. We aren’t necessarily talking about employee’s desks here. The majority of workers have a good handle upon how they manage their stuff on their desks. What might look like a pile of clutter to some folks, might be “organized chaos” to one other person. If a staff member gets their work done in an efficient manner yet their desk is chaos, leave them alone. They should already know what they’re doing. However, spaces which have to be clutter-free include reception areas, lobbies, restrooms, as well as document filing areas. A strategy includes digitalizing as many documents as you can. Electronic documents don’t take up physical space. However, if your office is dependent upon paper, you ought to have an effective system for correctly storing them. A simplistic feather duster may keep the majority of computer screens and additional office equipment appearing fresh, particularly if they’re black in color. The specific environment of your workplace is going to determine how often this has to be done, yet if you see any dust, give it a little swipe using a feather duster. Make certain that you invest in one that has ostrich feathers. All other feather dusters are worthless. Usually, computer screens have to be wiped down since they’ll get touched with pointy fingers all day long. Utilize a great screen cleaning system from a technology shop. The majority of office garbage cans don’t have anything that has offensive smells. However, for the ones who have to eat at their desks (not suggested, desks are dirty), it is wise that lunch waste be taken over to a bin inside the breakroom for disposal. Or else this trash will start to smell even after a single day. Plus, if you do not have a regular janitorial service company, this stuff is going to fester. Getting your staff members to deal with these things by themselves might seem like an improbable task, particularly in the break rooms and common areas (and we have not even mentioned bathrooms). That is why we are here. However, in dealing with simplistic tasks by yourself, if you do have to hire us for janitorial tasks, it’s possible to get a lower price for what cannot reasonably be accomplished on your own. In addition, check out the above ideas before calling us to ensure that you do not spend more than you need to. For more information on our commercial facilities cleaning services please feel free to get in touch with Anago right away! As with any medical clinic, your vet practice is an area in which you turn health crises and problems into recovery and healing. Keeping the exam rooms, clinic, and public spaces clean often can be more of a challenge than with a physician’s office. How is it possible to increase cleanliness at your vet office? Below we list five tips any vet may use. Your team members are professional and trained animal caretakers; however, they likely are not expert cleaners. For best results, use an outside service at least one time a week to provide your office a proper cleaning and sanitization. Write written directions for important tasks like disinfecting examination rooms and operating rooms after and before use, tool and handwashing sanitization, and complete kennel cleaning. Go over the directions with all staff members and post them in simple to spot locations. Checklists are an essential tool even if they seem as if they are overkill. You might want to get a closing and opening checklist ready, and lists for cleaning rooms after patient usage. Have staff members initial tasks as completed. Focusing on the surfaces and floors in the clinic might cause you to forget about the invisible cleaning aids inside your clinic. One of those includes the ventilation system. Sometimes vet practices develop a smell because of an animal’s condition, and customers might notice its as soon as they get inside the reception space. Properly circulating air out of the examination rooms, restrooms, and kennels aids in preventing germs from settling and producing smells. Work with a skilled ventilation service to figure out how best to recirculate and filter air in those critical areas. Air from specific rooms, like the kennels or any isolation wards, shouldn’t mix with the remainder of the office’s circulation. The less objects you have along walls and on the floors, the fewer places debris and dust will accumulate. Taking away unneeded clutter assists the cleaning service in being thorough and makes emergency clean-ups more convenient for your team. Many practices may cut down on clutter in a couple of ways. One includes working to digitize paperwork and records using electronic documentation, online portals for patients and cloud storage services. Digitizing paperwork decreases mountains of papers, clutter on desks, and client files. Also, do a complete spring cleaning at least one time a year and think about storing unutilized documentation or equipment at a safe place offsite. Be certain to select quality disinfecting products and teach everyone how to properly use them. For instance, you ought to dilute most products. But, over diluting them makes them less efficient as a sanitizer and not diluting them enough may cause skin damage or inhalation risks for animals and humans alike. Work with the cleaning service to figure out efficient alternatives to harsh chemicals, as well as animal-friendly varieties in which chemicals are needed. 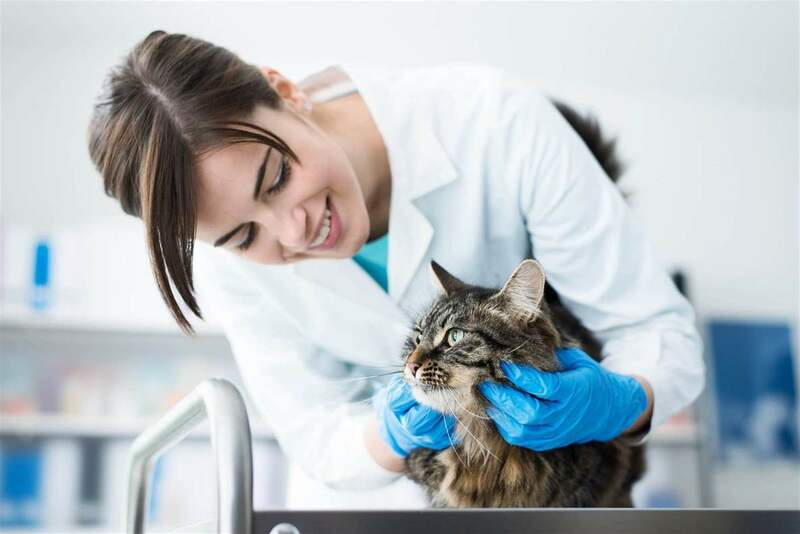 To get your vet office on the path to thorough sanitation and cleanliness, call us at Anago. For more information on our Winnipeg janitorial services contact Anago today!